A man was stabbed in the chest and 13 people were arrested after violence marred an English League Cup tie between Premier League side West Ham and east London neighbors Millwall. The 44-year-old man was stabbed in Priory Road, a few yards from West Ham’s stadium as fans clashed with police before and after the match; police say he is now in a stable condition. 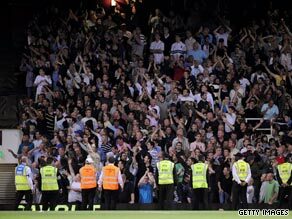 During the match, which West Ham won 3-1, fans fought with police and stewards inside the stadium and play was temporarily suspended when numerous supporters invaded the pitch. Metropolitan Police chief superintendent Steve Wisbey, who was in charge of policing the match, confirmed his force were investigating the events and would seek to punish those responsible for the trouble. Commenting on the tie which has a tradition for trouble among rival fans Wisbey added: “Police worked closely with West Ham Football Club, British Transport Police and the local authority to minimize disorder. “Officers responded swiftly whilst missiles were being thrown as they tried to separate fans outside the ground after the match. “Incidents of this nature at a match are thankfully rare, but it would appear that a small number of supporters were intent on causing a confrontation. “A team of dedicated police officers will be reviewing all the events that took place and will be looking at CCTV both inside and outside the ground to identify evidence of offenses and offenders. “We will proactively seek to obtain football-banning orders for those responsible so they will not be permitted in stadiums throughout the country or abroad.” The Football Association (FA), who are currently promoting England’s bid to stage the 2018 or 2022 World Cup, have denounced the violence. “We absolutely condemn all of the disorder that has occurred at Upton Park, both inside and outside of the ground,” an FA spokesman said. “We will very quickly be working with all parties, including the police and clubs to establish the facts surrounding the events. We expect all culprits to be banned from football for life – they have no place in our game.” And West Ham confirmed they are assisting with investigations and would not hesitate to issue lifetime bans to those deemed to have been intent on causing trouble. A statement on the club’s Web site said: “West Ham United will fully investigate the deplorable scenes that took place during the cup tie with Millwall on Tuesday evening. “The club will not tolerate the unacceptable behavior witnessed inside the Boleyn Ground and will take the strongest possible action against anyone found responsible, including life bans. “As was the case before, during and after the match, we are cooperating fully with the relevant agencies, including the police.” The incident caps an troubled period for West Ham off the pitch following the stabbing of defender Calum Davenport and the death of the father of midfielder Jack Collison in a motorbike accident in recent weeks.